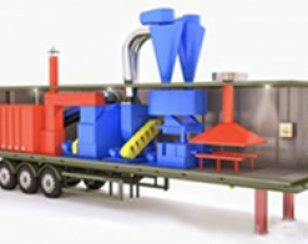 In working area of aerodynamic dispergator simultaneous processes of material drying and grinding execute, that leads to decreasing of drying time and energy consumption. Material drying in aerodynamic dispergator is assured by intensive air-mass exchange, which is the result of technical solution of this equipment. Material particles are held in drying-grinding zone by inertial forces. Material particles form fluidizated bed at the outer radius of horn rotation, through it desiccant agent is blown – air. Airflow, which assures material drying, is 30.000 cubic meter/hour, flow rate is 25-26 metres/second relative to material particles, which are in fluidizated bed. The principle of inertial separation is used in aerodynamic dispergator. Inertial separation is a selection of material particles, which have necessary characteristics, it executes from drying-grinding area. As a result of inertial separation material particles are passed away only with necessary humidity. Drying process in aerodynamic dispergator also increases owing to intensive friction and collision of particles with each other in dense velocity (fluidizated) layer by motion with high circumferential velocity in aerodynamic dispergator. It’s acceptable to use heat carrier with temperature range to 250 C.